The Perfex Pedestal Aluminum Signage Display Stand - Horizontal is an excellent long-term solution for the displaying of your advertising signage needs. The unique design of the Perfex Pedestal Aluminum Signage Display Stand has a horizontal sign frame that is 17 inches (W) x 11 inches (H) connected to a telescoping pole that has an adjustable height from 26-50 inches tall. 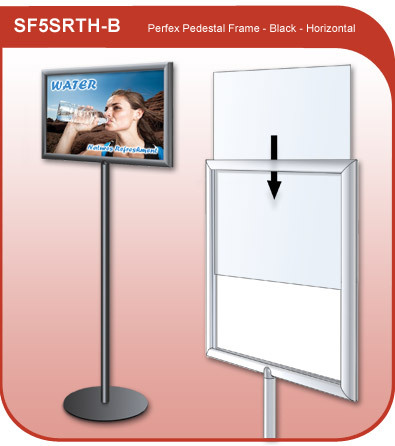 The model SF5SRTH-B can be used for displaying signage in a range of retail environments. The sign stand is made from aluminum and has a round 11 inch base for extra support.